The town is a very popular destination at Christmas time. The town’s attractive setting, nestled above the River Lune, the array of interlocking streets and squares and a main shopping street boasting one of the best ranges of independent shops in the region gives it a very special appeal in the festive season. Whats on and not to be missed? Once more there will be a chalet village in the heart of the town for the Christmas fair weekend. Wooden chalets will be clustered around the market monument offering shoppers a wide range of gift items from near and far. We will also have an indoor market at Lunesdale Hall with more gift and craft stalls, including jewellery, Christmas decorations, art, soft furnishings and more. Park at Kirkby Lonsdale Rugby Club on the B6254. Follow the signs from the A65 north of the town onto Hophouse Lane and through Underley. Buses run every 15 minutes. 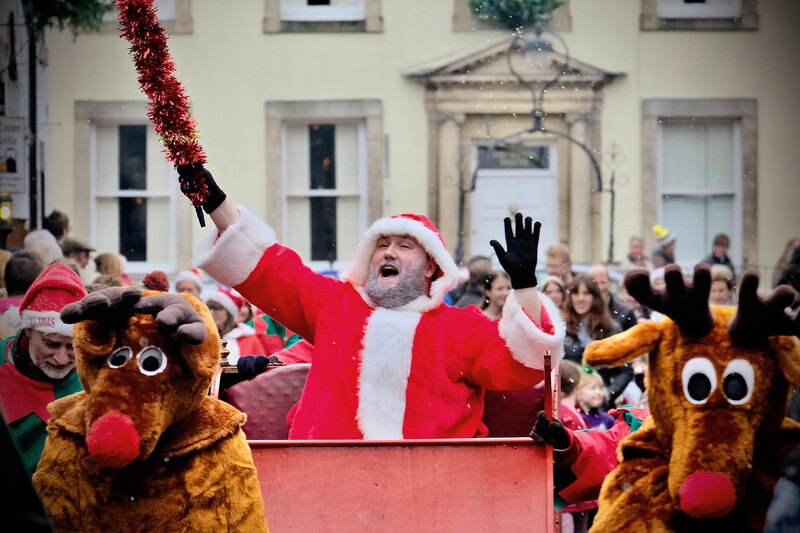 Park and ride offers a hassle-free weekend, being dropped off in Queen's Square so you can walk through the town, taking in the entertainment, unique Festive retail in St Mary's Church, Church Lane and at retailers all over Main Street. Then continue down Main Street for more entertainment and the Chalet Village in the Market Square and the indoor market and more entertainment in Lunesdale Hall. The Park and Ride accepts well-behaved dogs and will be running Friday, 4pm to 8pm and Saturday/Sunday 10am to 5pm. High quality bric a brac. Tea and Coffee and homemade cakes available. Create a reindeer Christmas tree bauble to remind you of your festive visit to Kirkby Lonsdale or make a marshmallow snowman treat to take away or eat straightaway! £1 each. Relax with some seasonal music in the lovely surroundings of St Mary's Church at after a day of Christmas shopping. All welcome. Free Admission. Retiring collection in aid of St Mary's Church. Sunday afternoon of Live music from Hatrick, come along enjoy a beer or two during the Christmas Weekend in Kirkby Lonsdale. Fun affordable baking gifts for all occasions. Cocktails mocktails gin, prosecco and fudge. A range of award winning pies and pasties. Ugandan crafts raising funds for orphaned and destitute children in Uganda. Award-winning café serving mulled wine. Fresh, tasty Italian street food. Snacks including burgers & sausage swirls. Contemporary furniture and home accessories. Unique country crafts, sheep foot stools and woollen bunting. Hand Crafted clothing and giftware from Nepal. Coffee, beer and hot drinks. Soaps, Bath Bombs, Lotions & Gift Sets. Luxurious and unique cashmere baby coats. Candles, lanterns, wax burners & homewares. The home of hog roast in Cumbria & The Dales. Dining ware and ceramic sculpture. If you live or work in Cumbria, get offers & discounts with a MyCumbria card. Natural art combining printmaking, painting and wood carving. Luxury florist specialising in Weddings, Bouquets & Arrangements. Glass Design Studio and Contemporary Art and Craft Gallery. Authentic homemade Italian food including churros. 100% hand crafted wooden homewares, gifts, and personalised items.